The cello part for the Overture from Mozart's The Magic Flute, K. 620 has been edited by Jonathan Pegis, a cellist in the Chicago Symphony since 1986 and an active performer in the symphony's chamber music series. Pegis' bowings, fingerings and other editorial markings have been added throughout the score. The Magic Flute (Die Zauberflöte) is a two-act opera composed by Wolfgang Amadeus Mozart and based on a German libretto by Emanuel Schikaneder. The opera was the culmination of a period of increasing involvement by Mozart with Schikaneder's theatrical troupe. It was an example of the popular dramatic style known as Singspiel, a blend of singing and spoken text. Although Mozart started it before La clemenza di Tito, The Magic Flute was the last opera Mozart completed. It premiered in 1791, the same year of Mozart's death, at Schikaneder's theater in Vienna. The succinct and energetic Overture to The Magic Flute was finished only days before the premiere of the opera. In addition to comedy and romance, the opera contained a more serious ethical side. Mozart and Schikaneder, both Freemasons, incorporated some of the symbolism of the Masonic rites into the music and plot of their opera. As the number three possessed mystical significance, the Overture opens with a slow introduction of three noble and solemn chords outlining the home key of E-flat major (with 3 flats). The music then leaps into a dynamic Allegro with fugal treatment of the movement’s single theme. There is little pause as it gallops through the Overture and towards the opera proper. 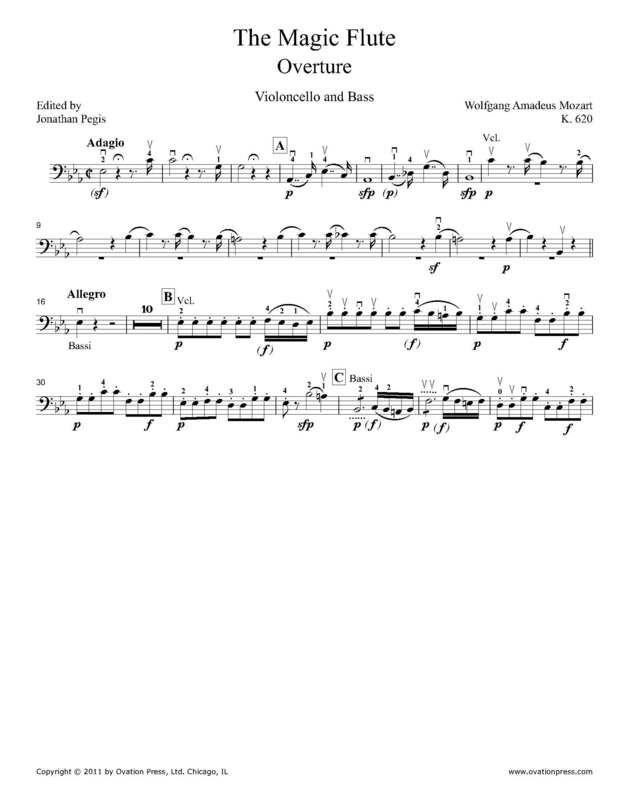 Download and print the score today to gain access to expertly edited Mozart The Magic Flute Overture cello fingerings and bowings from Jonathan Pegis!